Den 22. februar 1944 styrtede B17 42-31377 ned her i Thy efter at besætningen med Sgt Lester Schrenk var sprunget ud med faldskærm. ID+Lester Schrenk. Den 23. april 2012 besøgte Lester Schrenk og hans familie tidligere Oberleutnant Hans Hermann Müller, som skød Schrenks B-17 Pot O' Gold ned. Se telegram. ikonet for AFSPIL og til højre på linjen på ikonet for FULD SKÆRM) Se tekst. Se også FILM fra 27. marts 2013 28 min. 30 sek. TV/MIDT-VEST: Dødsfjender. Se Fliegerhorst Grove med Afsnit 4 1944-1945 med mere om nedskydningen. B-17 Flight 2013 fortæller om Lester Schrenks flyvetur den 13. juli 2013 i en B-17. Se artikel af Villy Dall i Thisted Dagblad den 22. februar 2014 Kom ned med faldskærm i Thy for 70 år siden - pdf-fil fra Lars Kanstrup købt hos NORDJYSKE. On 22 February 1944 B17 42-31377 crashed here in Thy after the crew with Sgt Lester Schrenk had bailed out. See ID + Lester Schrenk. 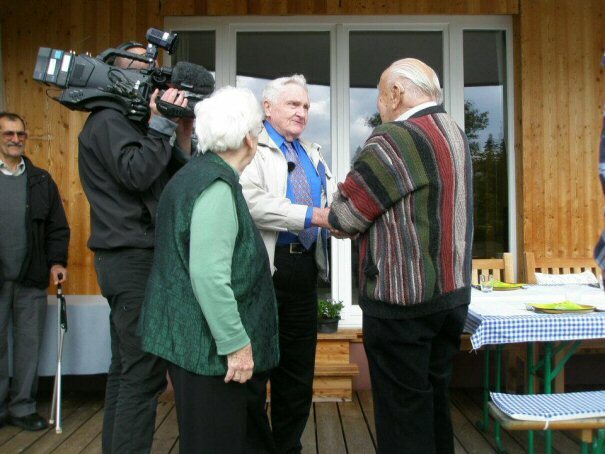 On 23 April 2012 Lester Schrenk and his family visited former Oberleutnant Hans Hermann Müller who shot down Schrenk's B-17 Pot O' Gold. 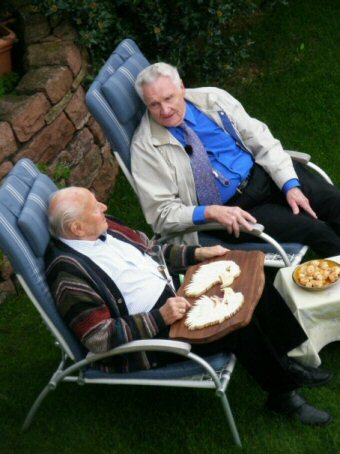 See Lester Schrenk and Hans Hermann Müller in uniforms and TV item from 25 April 2012 2 min. 47 sec. TV/MIDT-VEST: Mortal Enemies become friends (click on icons for PLAY and for FULL SCREEN) Print the speech. See also FILM from 27 March 2013 28 min. 30 sec. TV/MIDT-VEST: Mortal Enemies. On 23 MAY 2015 PIONEER PRESS had the story that the film "Mortal Enemies" by Danish TV would air on 24 MAY 2015 on Twin Cities Public Television! See Fliegerhorst Grove with Part 4 1944-1945 with more about the shootdown. See also B-17 Flight 2013 about Lester Schrenk's flight on 13 July 2013. See also the article Came down by parachute in Thy on this day 70 years ago from 22 February 2014 written by Villy Dall, translated into English by AS and KK. A response was Account from Herluf Munkholm which you may compare with Lester Schrenk - The day of my capture. See telegram to his parents. and on 9 May 2012 he added his letter that started it all. On 29 May 2012 he sent How I met the German Pilot. Photo of HHM's JU 88 was added in DEC 2012.
and the plane crashed in northern Denmark. recalling old war stories. Understanding was no problem as he, his Daughter Birgit and her Husband Thomas and Grand Daughter Daniela all spoke perfect English. The entire event was covered by a Danish film crew making a documentary for TV. World News and other newspapers and also TV film crews to welcome us. I have never seen so many flash photos in my life. It was endless. of Heidelberg. He was very nice and really did make us feel welcome. Next Hans Hermann and his wife Lydia took us to a top notch restaurant for a dinner and as always at any event, beer flowed freely. It was most enjoyable. Later they gave us a tour of the old section of Heidelberg. It was wonderful. problem. Then Hans Hermann again treated us to a full dinner and beer while on the boat. By this time strangers would approach us and wish to shake our hand and to indicate that they had read the story in the newspapers. Always the feeling was positive. Everyone was most friendly. This happened dozens of times while we were in the Heidelberg area. It made us feel like celebrities. Before leaving Heidelberg, Hans Herman and Lydia again invited us to their house for what she called a snack, but which was more like a 5 course meal. Saying goodbye was very hard. Neither of us wanted to part. We had become very good friends and sadly said goodbye. helping locating Hans Hermann, the German pilot, and did much in making the necessary arrangements for the trip. very famous bridge in WWII) we stayed for the night as we wished to view the bridge and towers and railroad tunnels that were so famous during World War II. started all over again. This man promised that he would send a DVD as soon as he had it finished. I am certain that he will do so. the bridge. We spent a lovely evening with him and his wife. Along the way we visited many old towns all with very narrow streets, many with several old castles. Soon we reached the Bavarian Alps with snow covered mountains. went through the Black Forest and visited a clock museum. Sadly time to return home approached much too quickly and it was time to say goodbye. May 2008, so we knew them well and also enjoyed their company. The film company also paid for our tickets and hotels while in Heidelberg. What could be better?? The trip and visit were the best ever. Never a problem, everyone we met was very friendly and helpful. It just could not have been better.